Why read YET ANOTHER well researched study, grinding out the insignificant details of who, what, when, where and why we have yet another social problem? All problems in our society really only come from ONE problem. The trouble in our past, present and future can be explained in one simple sentence…. Failed fathers create challenging and troubled children! Oh! You don’t believe it? You think it’s much more complicated than that? Allow me to prove that it’s not complicated at all. Let me take you on a brief history tour of ‘failing fathers’ so you can see what kind of children they’ve produced. When Saddam Hussein’s father Hussein al-Majid fled the family, it was up to Saddam’s mother Subha to raise him. When she could not, little Saddam was given over to his uncle Khairallah Tulfah, an army officer and fervent Arab nationalist. A deep bond between Saddam and his uncle Khairallah developed. Khairalla was an argumentative and bad tempered individual but he inspired great respect and hero worship in young Saddam. When Saddam was still a boy, Khairalla was expelled from the army and sent to prison for five years because of his public sympathy for Adolf Hitler and the Nazi belief system. Saddam missed him greatly. With Khairalla away at prison, young Saddam was sent back to his mother who had now remarried a poor and reportedly lazy peasant named Hassan al-Ibrahim. By the time Saddam rejoined the family, he found several new half brothers and sisters waiting for him. Saddam’s step father found him to be an inconvenience. And what kind of adult did Saddam grow up to be? I don’t think I even need to answer that. Joseph Stalin’s mother was described as strict, but what created the power of a dictator was his father Vissarion. Frequently drunk, Vissarion inflicted brutal blows on young Joseph. No matter where you look, when you find suffering, loss, pain and sorrow, it is created by a leader who was raised by a failing father (or lack thereof). Not convinced with world dictators? Let’s move closer to home. How many prisons are operating today? According to the Bureau of Justice there are now “1,664 prisons holding 1,214,969 prisoners!” (5) And that’s just the men! These prisons were built by tax paying Americans so we can enjoy the benefits of our law abiding way of life. To protect this, we take over a million men and lock them away from the rest of us because of the danger that they represent. And how many of those 1,214,969 men come from troubled fathers? About 85% of them (6). Prisons exist because of troubled fathers. Whether it’s minimum, medium or maximum security prisons, troubled fathers put those men there. Their fathers put them in a condition and in a position where they are dangerous to the rest of us. Do you need to know about the father of Al Capone, John Dillinger, Jeffrey Dahmer or any other man on the very long list of cruel and morally disfigured men? I didn’t think so. The stories are basically the same…failing fathers. I said it before and I will say it again, there is no problem in our lives except a father problem! BUT…if there are failing fathers, then there are also FAITHFUL fathers…. The story you always heard about honest George Washington and the cherry tree incident cannot be confirmed through George Washington’s family history, but what you didn’t know is that our nation’s first president’s father was very fond of his children according to George Washington’s memory of him. His father, Augustine Washington, instilled a work ethic and integrity into little George as he built farms and a mining business. You know about his unwillingness to quit despite multiple defeats, but you didn’t know that his work ethic came from his father Tom Lincoln, the cutting edge farmer who turned wild acres into farm land. Tom showed his pride in his son’s education, even though he could not teach Abe knowledge from books. He did instill the determination to never quit under any circumstances as he encouraged Abe to pursue the talents of his bright mind. Harry sometimes lectured Vince on his triangle of success: sense of duty, respect for authority and strong mental discipline. So there you have it…Saddam Hussein, Joseph Stalin, Karl Marx, Adolph Hitler…children of failing fathers. George Washington, Abraham Lincoln, Martin Luther King Jr., Vince Lombardi…children of FAITHFUL fathers. Do you have marriage trouble, employee trouble or boss trouble? Do you have an endless stream of life’s troubles that won’t leave you feeling safe or secure? It’s simply, completely and forever a father problem. It’s a simple fact of life…the more ANGER or FEAR you had in the first 10 years of your childhood, the more trouble you ARE or HAVE today. Did you end up with a failing father? Want to know how you can be certain? You can be sure by giving your father the Real Dad Score using the Real Dad definition. What is the Real Dad definition? It’s the definition that sets the standard for what a true father must be in order to turn out positive, productive, contributing adults which create successful future generations. A Real Dad is consistently tough but fair. He takes a genuine interest in the challenges, opportunities and joys of each of his unique children. That’s it. Imagine what the world would be like if every father could fulfill that single, simple definition. What kind of nation would we have? Giving your father a Real Dad score is very easy. First, scan your memories of the first ten years of your life. These were the first ten years when your brain neurons were being formed. These are the years that really mattered. In those ten years, score your father against the definition. On a 100% down to 0% scale, your dad was consistently tough but fair; he took a genuine interest in your challenges, opportunities and joys and he treated you like a unique person. Now scan your first ten years of memories, some scenes with your father may jump out, but beyond those, you have this feeling, this sense about your father in that childhood time that allows you to emotionally, yet accurately give him a rating against this very simple standard of what a Real Dad is. If your father scored in the 90%’s, you are a very successful person and everything you touch turns into something good. It doesn’t mean your life is trouble free, but it does mean that you get through troubles and come out on the other side in a better condition than when you went in. Most of all, you learn from your mistakes and don’t make them a way of life. If your father scored in the 80’s, you are leading a content life where struggles are few and far between, certainly not a pattern. You’re still successful. If your father scored in the 70’s you may have some issues, but they are not anything you can’t work around. Some anger, some fear but you can do what you need to deal with it. A Real Dad score in the 60’s range shows the beginning of life troubles. Failing fathers produce patterns of difficulty in family, friends, self image, health, money, time and peace of mind that are troubling and persistent throughout the lives of their children. Look around you. You have uncles, grandfathers and dads. Look at their children. You know their children! Know any challenging children in your family tree? Look at their fathers. You’ve heard the slogan, but now you can see the truth in it: “The apple doesn’t fall far from the tree.” That’s the profound truth. The father makes the quality of apple, (son/daughter), and with few exceptions, apples stay where they fall. Real Dad scores in the 50’s and below are much more intense. As your Real Dad score drops below the 50’s, trouble has been a pattern of your life. This trouble can come out in a multitude of ways, but the worst sides of your father are coming out in you through your career, your marriage, your social life and everything! Do you have a raging temper when situations become frustrating? Just look to your dad. Do you have the ability to win friends and influence people? Thank your dad. Real Dad is a phrase that describes the adult male who was present in your first ten years of life. The most successful people have their biological father as the person who fulfills the Real Dad definition, but in life, that is not always possible. It is so very important for you to know that the life your father gave you is not your fault. You were “programmed” at a time when you did not have all the facts. You were not able to logically sort out your own opinions. You took on your father’s values without even knowing it. If you have troubles today, it’s NOT your fault, but it IS your responsibility to take control of them. There are ways for you to change course on those values that bring trouble to yourself and others. I’ve written a book that will show you how to bring your troubles to an end by building your self-esteem and controlling your negative feelings. It is based on everything I’ve learned over the past 30 years in an effort to make up for what I was ‘missing’…because I was NOT raised by a Real Dad. Should you blame your father with anger and resent that he saddled you with these problems? How could you? Your father did everything based on what he knew at the time. What else could he do? Become a wonderful father suddenly? After all, it was your grandfather’s values that your father was living off of. This is the reason generations of successful families produce generations of successful adults as seen in the case of the Rockefeller and the DuPont’s. It’s also the reason there are “crime families”. So what can you do to become a Real Dad if you’re not gifted by the father you were given? First you must really and truly want to do it. Do you have a child or children you feel responsible for? Do you feel something deep inside that makes you about what kind of adults they will become? If you did not have a Real Dad yourself, you must find out whether or not there a desire inside you to change the course of history for your children. If you have this desire, then you need a single thing to focus on. You must focus on one idea that will act as your faithful compass. This compass is one message that puts everything you need in one place, with one goal: Become a Real Dad. The following statement is what you must follow in every situation with your children. Without this compass, you’ll drift and forget. I am a Real Dad. I am consistently tough but fair. I take a genuine interest in the challenges, opportunities and joys of each of my unique children. Repeat this to yourself. Repeat it again. Say it over and over while you’re driving in the car alone. Say it under your breath when your children are testing you in their most difficult moments. At the end of this article is the compass set in type that you can hang on the wall or carry it in your wallet. If you are serious about becoming a Real Dad, put one in your bedroom, your living room, your bathroom and your kitchen. You children will even help you remember. 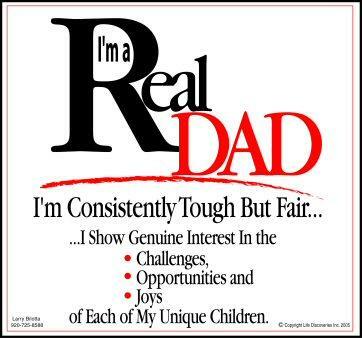 They will quote the Real Dad definition and view you as a faithful father. During those times when your children challenge you and test your patience, you must resist the urge to give in to your negative feelings. Your children need you to succeed. No matter where they are in those critical ten years, they will be cheering you on to be a Faithful Father…a Real Dad. CONSISTENT: This means you are not controlled by your moods. You don’t ignore a discipline problem on Tuesday, and then pounce on your children for the same act on Wednesday. TOUGH: This means you learn how to discipline your children from people wiser than you. Your toughness is appropriate, but never overboard. You set limits for your kids and those limits are strong, firm and based on positive values. When you are tough, you always remain emotionally in control. FAIR: You are not a pushover and you are not weak. You are fair. You know how to forgive your children and teach them through every day situations. You teach but also listen to their ideas, giving them the benefit of the doubt when you must. GENUINE INTEREST: If most fathers were really honest, they would admit their interests are often for themselves and not their children. Showing a genuine interest in your children on a consistent basis requires you to stay focused on a big cause…you are producing America’s future adults and you are doing it now, tomorrow afternoon, at the ice cream stand and the community pool. Let them know they are very important to you. CHALLENGES: Children must learn through failure. When they fail, you, their father, must give them the opportunity to discover that ALL growth takes place through failures, not successes. Show them how to get up and get through it. OPPORTUNITIES: Your children’s opportunities are tiny compared to yours, but you must notice when a new event brings them a chance to learn- a vacation invitation with a friends’ family, a new club to join, a lemonade stand. Encourage their opportunities to learn about this world. Be interested and ask questions to get them thinking. JOYS: When things go right, dad and his kids must celebrate. You must notice and get just as happy as they are. Joy is what happens between a father and his children when failures have done their work and success arrives in small and large doses. UNIQUE: Each of your children is not the same. Notice all the ways they show their uniqueness. Let them know you notice in a multitude of ways and they will be fiercely loyal to you. If you want to know more about how your values pass from generation to generation, read the article “Your Invisible Lifestyle: Is it helping or hurting your marriage?”click here. I am not sure I agree totally with blaming fathers for our failures. I think that somewhere along the line we make our own choices as to right and wrong and what kind of a person we want to be. HOWEVER I do believe that parents shape their childrens’ concepts of themselves even while they are still in their mother’s womb. Here’s the big question…How so we bring this message…of active positive parenting, to the people who so need to hear the message and stop the negative cycles within their own households? Sorry for the delayed response, I didn’t realize you posted a response until now! Woops! I truly appreciate you sharing your opinion on my blog, I’d like to build a sort of “community” where we can come to discuss different issues and share our opinions. The second article I wrote on REAL DADs hopefully clarified my point in the article a little better than the first did, so I would encourage you to read that if you haven’t already. I did not want to emphasize placing blame on fathers, I meant to create awareness so fathers understand how important a role they play in their children’s lives. The key to breaking negative cycles is becoming aware of the key role that fathers play in their children’s lives. Fathers need to work towards becoming what I defined in the definition of a REAL DAD. I am the mother of a seventeen year old young man. I divorced his father when he was four years old. We shared joint custody of him. I left this man because he could say the meanest, hurtful words in anger. I was raised by one of the good dad’s. He was loving, supportive, and firm. I had never been yelled at in my life. I guess the failing here is I didn’t realize people could be so cruel. I have raised my son the way I was raised. His father has belitted him, screamed and hit (only once and then I was able to secure full custody.) My son went through a terrible defiant period with a co-existing depression. Luckily he agreed to go to counseling with me and his life has changed since. In the case of our children, evil appears to prevail over good. My son is determined to break the cycle and be a “Real Dad” when he has children. I am always encouraged when I hear about any young person determined to break the cycle. That takes a great person to accomplish it. These are simple standards to compare your life against. Yes, the Real Dad theory can be applied to mothers and fathers, but there is one key and critical difference. You get your social skills from your mother. I’m reading between the lines but it seems like you had a very strong mother. You get your ability to feel emotionally secure from your father. Not many know this, but the more you discover your own history, the more you’ll see this is true. The less a father is involved in the life of his daughter, the more insecure, uncertain and vulnerable she will be in her adult life. Sometimes it will come out as anger and demands placed on the people closest to her. I have worked with so many couples over the years and have always found this to be a “natural law”. Have you downloaded my Invisible Lifestyle report? There’s more about this subject there. Thanks for your interest and I hope this helps Stephanie. I think you are way off base. I would rate my father, grandfather,and my son’s father in law at 100. These were great people. I have always had a great relationship with my son and I believe at worst he would rate me an 80 but most likely close to 100. However ,he has additive behavior-drugs and gamboling. He doen’t blame us , knows that we unconditionaly love him and we are directly involved in helping him through his counseling program. As he has said to us ” I know you are deeply concerned with my situation but you didn’t create it nor can you fix it. It is all up to me.” I am proud of the way he is dealing with this and I am proud of all his other accomplishments as he has done so much for so many. He will overcome his problems and eventually deal with them in a better manner. In a nut schell I believe that your hypothesis-by looking at these monsters you can predict what their children will be like is not indicative of the majority of the parents that I have seen that are dealing with this drug invested society that has been created. Shame on you for purporting this myth. I would like to say that thoughmaybe there are cases like the evil people you mentioned, there are cases where it is not true. Dr. Carson, probably the best brain surgeon in the USA, was raised by a mother was a poor, black woman who could not read. Everyday, she made him read to her and write a paper about what he read. She would look over his work and encourage him. He did not know until he was an adult that she could not read. I feel that society and the friends that the people you mentioned were more to blame for their behavior than how they were parented. As a parent you should try to instill good values into your children to choose the right friends and function in society as a good standing member. If a parent does not have good values, or let’s their children choose the wrong friends or the society in which they live in is harsh, the children will take the easy road to acceptence. Drug problems can almost always be traced back to the friends the drug abuseer chose. No person decides one day that they want to do drugs and seek out a drug dealer on their own. They have a friend who was doing drugs first and respected and trusted that person and their opinions. The BEST way to sto your kids from doing drugs is to know who they are choosing as friends and who that childs friends parents are as people. If you feel that uncomfortable with the friend or the parents, do not let you child continue in the relationship and find out what your child was looking at in such friendship, as you may find a problem that even they may not knows existed. Maybe, they have low self esteem. Maybe they can’t be one of the “jock” crowd for lack of physical talent. Maybe they see their idol does drugs and want to be that person and the list goes on. My husband has had an affair and my kids know. How do I handle this as far as my children? He is setting a hrrible example for them. How can this not affect them for the rest of their lives? At this time he is not working on our marriage and living outside the house. Both my husband and I have had horrible father examples. As you read these posts you can see a pattern of responses to my real dad article. Very few people disagree with the point that parents program your brain in the first 10 years with all this instructions on how to live and prioritize life. Before you tend to disagree with this, I want to make the point that there are three key truths that decide a person’s life. The first is their birth nature which is their core personality. I explain this as Control, Fun, Perfect and Peace natures. The second truth is how your brain is programmed in your first 10 years by the most important adults in your life. Finally the third truth is where your parents raised you on the chaos to purpose scale. The higher you are raised on the scale, the better you feel about yourself and the more positively you see your life and circumstances. The lower you were raised on the scale the more negatively you see your life and circumstances. I cover these ideas in more depth in my hardcover book Softhearted Woman Hard World. Also keep in mind the exceptions to the rule. They are rare. You seen the exception illustrated in the son who raised in the inner city by a single mother with three children by three different men. Two end up in halfway houses or prison while the third goes to Harvard and becomes a scientist. I call these people Bucker’s as in bucking Broncos. For a reason and science cannot understand, these people have a massive drive to go in the opposite direction from the way they were raised. I truly apologize for my English mistakes. I´m Mexican. I appreciate all the incredible articles!!! I agree totally with you on the fact that a loving, caring and supporting dad is really a key for developing a healthy self esteem on sons and daughters. I´m divorcing an insecure man with emotionally problems and with a very low self esteem. He never realize how much I loved him. During his childhood, his dad was always absent, only supporting economically, for the rest the dad was not caring, giving and showing love to him. The oldest daughter was the favorite one, and the dad was not caring on letting it show to the rest of the family. Her mom told him that his dad didn’t want that he born. He was the last one of four kids. The story of my marriage with him is long, painful, and complicated to write it here. But I can tell you, that my marriage with him was a very emotionally and mentally wasting painful one. Its hard to deal with a man that stay emotionally being a kid in need of love and nothing what you can do, will reassure it to him. I fully agree on this and I do hope that we are all learning. My father was absent and my brothers, especially my eldest is really struggling. The eldest just like you mentioned, career wise is lost and keeps saying he is ok where he is at, and that is doing nothing for himself. My other brother who I come after is a bit better because somehow he was attached to my mother but also struggling emotionally. He will say one thing and then say another and insists he meant the same thing. He is struggling with relationships…how can I help.. However, this one poor example doesn’t at all void the central idea that good fathers raise well adjusted children and it isn’t at all surprising to learn that monsters like Stalin were raised by abusive alcoholic fathers. However, there are a significant number of people who had terrible childhoods and despite that became well-adjusted happy adults. My dad never went to school, however, I became the first in my family(extended family) to attend high school up to A level. I had older brothers and cousins who didn’t achieve that coz they couldn’t get good grades. So, before wrote my A Levels I had chosen to do Computer Science once I passed high school. I told my dad and I think he somehow thoughht I was crazy coz he laughed and said that was out of my league. I always saw myself as a recordkbreaker but that really crashed me. I was 18 and I really looked up to my dad. I went on to fail my exams and that was the end of it. After I read your 7 steps. I identified that this incident always came to my mind whenever I was faced with a good opportunity and I would always go on to fail. I’m changing all that now and am beginning to think positive. Thanks, Larry. Thank you so much for sharing your story with me. All of life is about the original instructions from childhood. It’s what the world calls “Your Destiny”. Your destiny turns out to be the instructions that your mother and father built in your brain. And I can see from your story that you are born into a family that is completely against formal education. When a family is full of an energy, that energy fills your brain and makes all your decisions for you throughout your entire life. You were not born into a family of record breaker’s Owen. You were born into a family of routine people who will live their routine until they die. None of them have a desire to break records. But you are a bucker. A bucker has his own identity and you have the identity of a man who breaks the record. You might look up to your father but he is full of your family energy and that is the energy of routine. That’s why your father had to discourage you because he is controlled by his family program of routine. He laughed at you as if to say “None of us can break any records because we are forced to live the destiny of routine. How could you possibly be different from us?” Record breaker’s break through routine. They go beyond keeping the status quo. They break the tie with their family destiny and they do great things. From my own research I have discovered that most families contain one bucker. If it is a family of success, the bucker will break the routine and become a financial or moral failure. If the family struggles with poverty, the bucker will break through the poverty program and achieve great success doing things the family members never did. Next Next post: Before You BLAME Your Father… Read This!